Free d-aspartate (d-Asp) occurs in substantial amounts in the brain at the embryonic phase and in the first few postnatal days, and strongly decreases in adulthood. 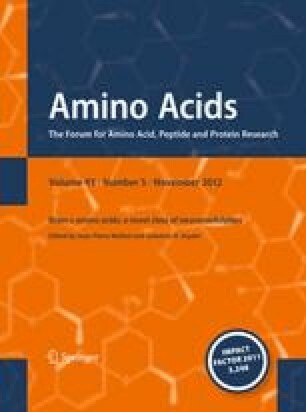 Temporal reduction of d-Asp levels depends on the postnatal onset of d-aspartate oxidase (DDO) activity, the only enzyme able to selectively degrade this d-amino acid. Several results indicate that d-Asp binds and activates N-methyl-d-aspartate receptors (NMDARs). Accordingly, recent studies have demonstrated that deregulated, higher levels of d-Asp, in knockout mice for Ddo gene and in d-Asp-treated mice, modulate hippocampal NMDAR-dependent long-term potentiation (LTP) and spatial memory. Moreover, similarly to d-serine, administration of d-Asp to old mice is able to rescue the physiological age-related decay of hippocampal LTP. In agreement with a neuromodulatory action of d-Asp on NMDARs, increased levels of this d-amino acid completely suppress long-term depression at corticostriatal synapses and attenuate the prepulse inhibition deficits produced in mice by the psychotomimetic drugs, amphetamine and MK-801. Based on the evidence which points to the ability of d-Asp to act as an endogenous agonist on NMDARs and considering the abundance of d-Asp during prenatal and early life, future studies will be crucial to address the effect of this molecule in the developmental processes of the brain controlled by the activation of NMDARs. F. E. was supported by a grant from the Italian Ministero dell’Istruzione, dell’Università e della Ricerca. A.U. represents the Mariano Scippacercola Foundation.